At the recent Homelessness and Affordable Housing debate (Nov 7, St. Andrew’s–Wesley Church), mayoral candidates Gregor Robertson and Suzanne Anton said a lot of things, but they didn’t debate much. They both admitted that they will not slow down or pause destructive market development in the Downtown Eastside (DTES). They agreed that a municipal tax on real estate speculation and non-resident property ownership would not be appropriate. They also agreed that inclusionary zoning, a soft and widely used development permit mechanism that forces developers to include affordable housing in all market developments, would not be good for Vancouver. They even agreed that the solution to the affordable rental housing and homelessness crisis caused by the real estate market is to be found back in the market itself. Put simply, their differences were of degree, not principle. 1) Buy 10 sites a year in the DTES for 5 years and dedicate these sites for social housing to replace all 5,000 units of unsafe, unstable, unhealthy SRO hotel housing. With new social housing construction, the city’s responsibility is to buy and provide land. In addition to buying available properties, the city should buy any SRO hotel that comes up for sale in order to protect low-income housing from the hostile waters of the real estate market. City Council has not purchased one single new property in the DTES for social housing in more than three years. Everyone recognizes that there is a housing and homelessness crisis in Vancouver and in the DTES in particular, but neither mayoral candidate has yet indicated they are willing to buy the land necessary to build the housing. 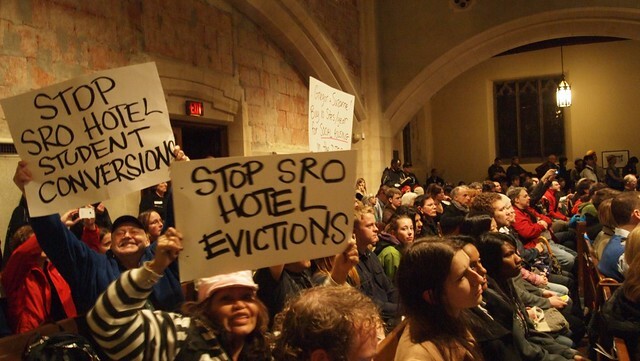 2) The city must close the loopholes in the SRA bylaw: Define “conversion” of SRO hotels as raising rents above welfare and pension-affordable rates of $375/month. The DTES low-income community is losing SRO hotel rooms — the last stop for most residents before the street — to developer greed. Unfortunately, the City facilitates this by leaving loopholes in the SRA anti-conversion bylaw big enough to drop entire buildings through. By tying SRO hotel conversion to a dollar rent value, City Council could force those landlords who may be trying to squeeze more rent monies out of their investment properties to go through public application processes for exemptions to this bylaw. This simple action would cost Vancouver taxpayers nothing and would save thousands of units of low-income housing, like the formerly low-income rooms in the Columbia, Lotus, Alexander Court, and Golden Crown hotels which are now renting to students and young workers for more than double welfare shelter rates. It would also provide leadership needed to pressure the provincial government to create more effective rent controls in the Residential Tenancy Act, including putting an end to rent-increases without ceiling after evictions. 3) Implement an immediate moratorium on market development in the DTES to allow the DTES Local Area Planning process, not developers and market forces, to direct the future of the neighbourhood. This solution will also cost taxpayers nothing and will have more than one powerful meaning for the low-income community in the DTES. Low-income residents of the DTES rely on low-income affordable housing, nearby services, and on affordable shopping options for food, clothes, and other necessities of life. Gentrification transforms the neighbourhood block-by-block into higher-end shops, raises rents, upscales hotels to students and young worker housing, and introduces more policing, threatening all these low income neighbourhood essentials. The City’s policy has been to encourage, reward, and even directly subsidize gentrifying developments: the uber-high-end Keefer bar and celebrity hotel received a $50,000 heritage grant and an award from city council; mega-corporations London Drugs and Nesters Market received a 10-year tax holiday from the City for setting up shop in the Woodward’s condo complex; and the London Pub and Brixton Cafe received $1.4Million in taxbreaks and heritage and density bonuses from Council for their heritage development on the corner of Main and Georgia. A moratorium on market development would give the low-income community the breathing room necessary to work on getting the secure, safe, healthy social housing we all need rather than having to work to defend the substandard but affordable SRO hotel housing we currently have. A market development moratorium would send a powerful signal to the DTES low-income community that their needs, interests, and future are being taken seriously by Council and that the local area planning process is more than a token or placating gesture. Amidst all the bombast about housing and all the claims about ending homelessness, the DNC hopes that these top-three solutions get some attention. The mayoral candidates can take three real steps to end homelessness and take on the Vancouver housing crisis, and two of them don’t require spending a dime… but they will hurt the profit margins of the richest people in the city. This is, as they say, where the rubber hits the road. Homelessness may, yet again, be the issue of this election, but is ending it the priority of either major candidate? We await their responses to these challenges. Ivan Drury is a member of the Board of Directors of the Downtown Eastside Neighbourhood Council, and works with the Carnegie Community Action Project. Posted in City Hall, Downtown Eastside, Election 2011, Gentrification, Homelessness, Housing. Bookmark the permalink.